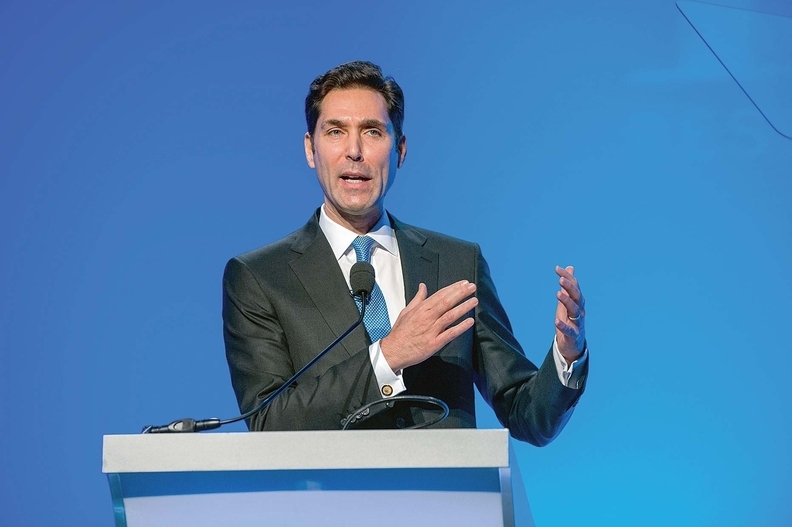 Stephen Ubl took over reins of the Pharmaceutical Research and Manufacturers of America last September just as public outrage over high drug prices was hitting its peak. A nimble inside-the-Beltway operative, Ubl came to PhRMA from the Advanced Medical Technology Association, the medical-device makers' trade group, where he won a two-year reprieve from the Affordable Care Act's device tax. He recently sat down for an interview with Modern Healthcare editor Merrill Goozner. This is an edited transcript. Modern Healthcare: Your industry is under attack by political candidates from left to right over high drug prices. Do you think you are being unfairly attacked? Stephen Ubl: Unfortunately, a lot of the campaign rhetoric is born of the mistaken view that drug prices are fueling overall cost growth. (That) is myopic because it focuses on list prices, not on net prices. It doesn't focus on the value of the products. We're trying to educate policymakers on both the marketplace dynamic, which I think is misunderstood, as well as the value the products bring to patient care and healthcare systems. MH: Yet over the past couple of years, drug spending has grown at a double-digit rate, while the hospital sector and the physician sector are growing about at the rate of the rest of the economy. What accounts for this higher spending on drugs, if not the higher prices? Ubl: Brand net price increases last year were about of 2.8%. CMS' own actuaries look out from now until 2020 and see drug prices moderating and drug costs growing closer to medical inflation. But the broader point is drug prices are the wrong target. We should really be looking at the cost of chronic disease. We all know that 80% of healthcare costs are driven by a small number of superusers. The majority of those costs are in institutional settings like hospitals, physician office visits and so forth. Better treatments and cures hold the greatest promise for ameliorating those costs. MH: Some institutions like Memorial Sloan Kettering Cancer Center have limited the number of drugs they use. They say the price isn't connected to the value they bring to patients. Do today's drug prices reflect their value? Ubl: We have a robust marketplace. We have a situation today where manufacturers are negotiating around value dimensions with payers and with the pharmacy benefit managers that now control about 80% of prescriptions written. Private-market negotiation is moving us toward a value-based discussion. There are changes that we can make that will move us more expeditiously toward more value-based pricing arrangements. Unfortunately, you have a number of barriers in law and regulations that stand in the way. For example, FDA law and regulation preclude companies from talking about products before they are approved by the FDA. Or, even after they are approved, if a company has information that would form the foundation of an outcomes-based arrangement—say that a product reduces possible readmissions—that can also run afoul of FDA law and regulations. MH: If we are on the edge of many scientific breakthroughs in medicine, how will we afford them given the prices put on the latest generation of breakthrough drugs? Ubl: The good news is that we have this rich pipeline that is going to produce valuable medicines that are going to revolutionize patient care. The reason we can afford it is because of this fierce marketplace competition. We have this evolution toward value-based care where increasingly payers, PBMs and physician leaders are involved in robust negotiations with manufacturers around value. MH: While you talk about a robust marketplace where payers and producers of the drugs can negotiate over prices, your organization has lobbied against allowing Medicare to negotiate. Why? Ubl: There is a right way and a wrong way to address healthcare costs holistically. We believe that there is already negotiation in the Medicare program. The Part D program is one of the few government programs that have come in under budget with very high patient-satisfaction rates. The HHS secretary and Congressional Budget Office directors of both political parties have said that if you allow Medicare to negotiate drug prices, it would produce negligible savings unless Medicare established a formulary or otherwise restricted access. MH: You are pushing through the 21st Century Cures Act for the government to allow the use of a different array of tools, which some patient-safety advocates have said might loosen the criteria for approving new drugs. Do you see any dangers in pushing for loosening some of the standards at the FDA? Ubl: We are very heartened that there is broad bipartisan support for seizing that opportunity. The administration has led with its Moonshot Initiative, the Personalized Medicine Initiative and the Brain Initiative. As you point out, we have to be careful as we look for opportunities to provide more expeditious access that we retain the FDA's gold standard for approval. Nobody is arguing that we should change that in the least. There are tools that could be used as we learn more about computer modeling, for example, that can streamline the process, whether that is through more rapid validation of biomarkers or using real-world evidence once a product is approved. MH: You have been very active trying to limit the ability of hospital systems and people who are getting discounts on drugs, like through the 340B program, to continue getting those discounts. Why shouldn't hospital systems be allowed to continue getting these discounts? Ubl: The 340B program in some cases is very appropriate. But I think our view in the broader context is that you have a situation today where there are mandatory Medicaid rebates, and there are supplemental rebates that states can forge on top of those rebates. You have seen considerable growth in the 340B program even as the uninsured population has decreased in recent years. Even our fiercest critics say it is applying upward pressure on list prices. That doesn't mean there isn't a very strong role for the 340B program, but we should keep marketplace distortions in mind. MH: What do you think of the actions of Turing Pharmaceuticals and Valeant Pharmaceuticals, where companies bought up generic drugs, that have been around for a long time, and put price increases on them that were totally inexplicable? Ubl: Those companies are really hedge funds masquerading as pharmaceutical companies, and don't reflect the values of legitimate, research-intensive companies within our membership. There are pragmatic steps that could be taken to address these situations. In the case of Martin Shkreli, who took a 62-year-old drug that is well off-patent and raised the price dramatically, you want to create an incentive for an entrepreneur or another company to come in on the other side of that equation and frankly eat Martin Shkreli's lunch. But it's very difficult to do that if it takes 50 months to get a competing generic product on the market.